"A wool circle skirt in April? That seems weird," one might say. Well, when I took these photos last week it was 30 degrees. And it snowed like four days ago. And I finished this skirt in December, so it was seasonally relevant when I made it, unlike my summer 2013 knitting bonanza. And my Draping class final project, which was also finished in December, but it still hasn't been warm enough to actually wear it outdoors to take a picture. In Tailoring class last semester we hand sewed a jacket and a companion piece. Both the jacket and companion piece had to be made out of 100% wool. We couldn't use fusible interfacing, machine stitched hems, or that sort of thing. So for my companion piece I made this circle skirt out of a wool suiting from Jo-Ann Fabrics. I like the length of this skirt. It's a little longer than I usually go, but I am very happy with it. I used a light pink invisible zipper as a nod to my Tailoring coat (which is light pink). And because zippers that don't match my garments are sort of my thing. 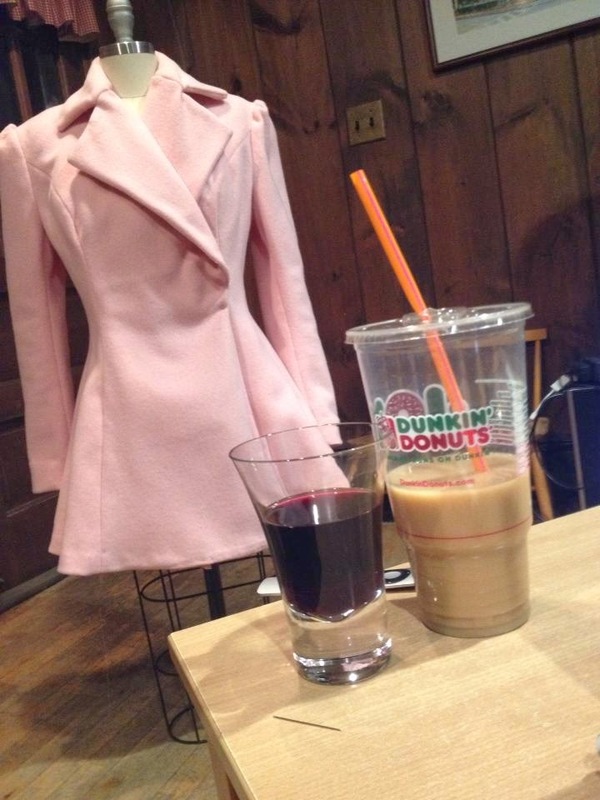 Red wine and Dunkin' Donuts...Whatever it takes. The pink coat is really cute!